Home > Magazine Deals > Outside Magazine Subscription for $4.99 A Year, 41¢ an Issue! 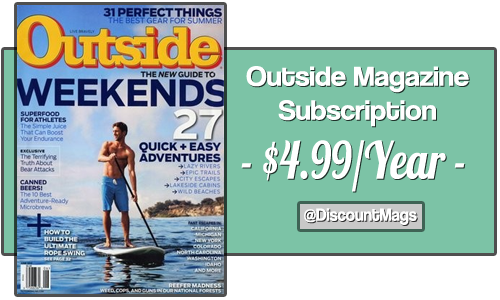 Outside Magazine Subscription for $4.99 A Year, 41¢ an Issue! Outside Magazine Subscriptions are on sale right now for $4.99 a year. You get 12 issues a year at 41¢ an issue! Enter the code: SOUTHERNSAVE then order up to 2 years. Outside Magazine is perfect for those who love to explore, travel and discover. Get new ideas or develop an inspiration to head out into the great outdoors. This offer expires on 2/12 at midnight.